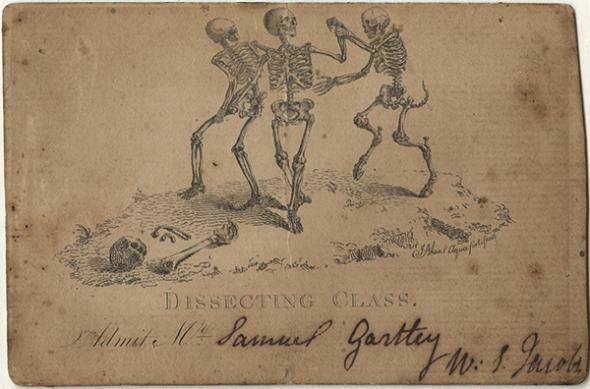 Tickets purchased by 18th- and 19th-century medical students let them into dissections and lectures. “With roughly 10 to 15 dollars in hand, anybody could purchase admission to a course of lectures directly from the professor, who profited directly from the students’ fees,” write Carol Benenson Perloff and Dr. Daniel M. Albert, the authors of a new book, Tickets to the Healing Arts: Medical Lecture Tickets of the 18th and 19th Centuries. Customers included not only matriculated medical students but also practicing physicians and “apprentices” laboring within the older, informal system of medical education. This proprietary enrollment system was upheld by unsalaried professors who worked like independent contractors, paying rent and overhead to the school’s dean out of ticket sales while pocketing the proceeds. This kind of arrangement became less common in the late 19th century, but it has fortuitously left us with a trove of ephemeral medical lecture tickets of different sizes, colors, and design; the oldest are handwritten, but most are printed with the name of the student, and sometimes the professor, added in handwriting . A few employ graphic illustrations. 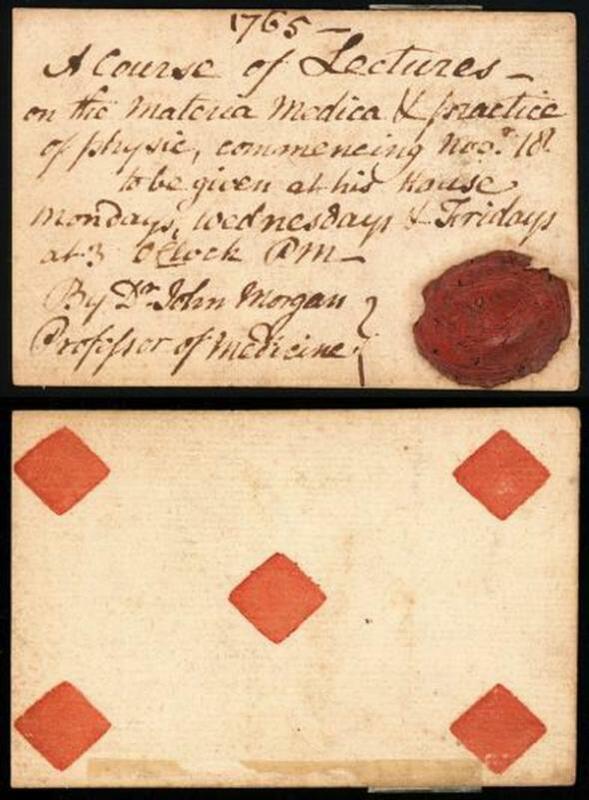 The University Archives at the University of Pennsylvania holds a collection of 1,150 such tickets from American medical schools (some now defunct) and “private practice” doctors. The illustrated book, Tickets to the Healing Arts (and its digital counterpart), describes 100 examples. 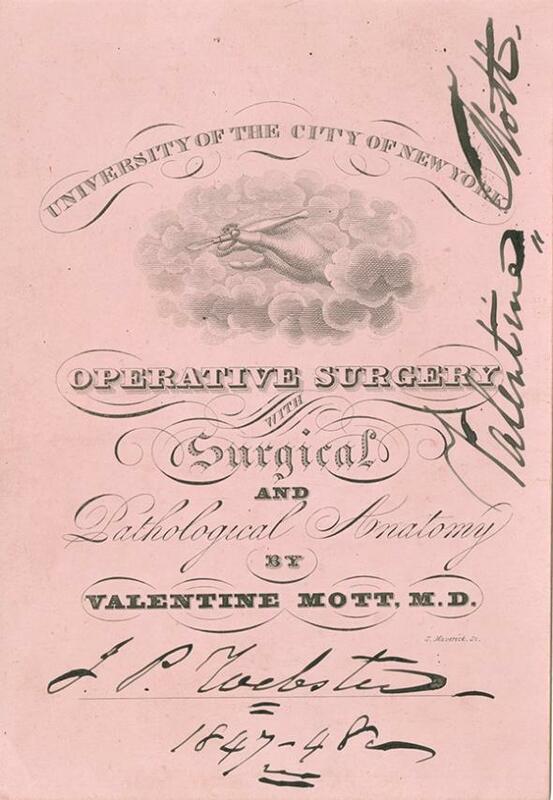 This ticket to Dr. Valentine Mott’s 1847-48 course on operative surgery with surgical and pathological anatomy at the University of the City of New York (later New York University), attended by one J.P. Webster, depicts a scalpel-wielding hand emerging from the clouds. Physician, poet, and educator Oliver Wendell Holmes Sr. (also the father of Supreme Court Justice Oliver Wendell Holmes Jr.) served as professor of anatomy and physiology at his alma mater, Harvard University, for 35 years. C.G. 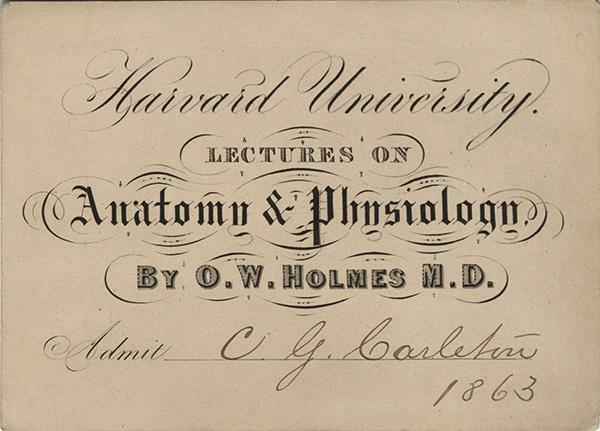 Carleton procured this ticket to attend Holmes’ class in 1863.